Realm of Horror - News and Blog: Exorcism documentary DELIVER US (Liberami) - out now on UK DVD! Exorcism documentary DELIVER US (Liberami) - out now on UK DVD! Federica Di Giacomo's award winning documentary DELIVER US (Liberami) (Venice Film Festival, 2016, Horizons Award, Best Film Winner. Nominated, Best Documentary at the 30th European Film Awards 2017) is out now on UK DVD. Exorcism is still a fact of contemporary life. Every year, more and more people claim that their illnesses are caused by demonic possession. Father Cataldo is a veteran, one of the most sought-after exorcists in Sicily. Every Tuesday, many believers follow his mass of liberation, searching for a cure for some adversity for which there does not seem to be a label or a remedy. The Catholic Church reacts to this crisis by nominating priests as exorcists in increasing numbers and by organizing training courses for them. In order to respond to the rising number of requests for deliverance from evil, all French dioceses have installed at least one exorcist. In Spain, the archdiocese of Madrid is desperately trying to fill seven additional positions. In Rome and Milan alone, the number of exorcists has grown from six to 12, and the Church has set up an emergency call center. In the US, the number of exorcists has increased tenfold over the last few years. 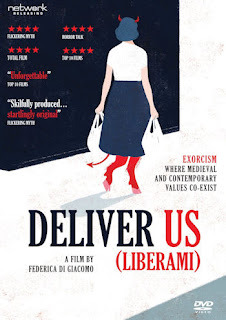 DELIVER US (Liberami) is available now on UK DVD from Network.